Copy/pasted from the Firefighter (10 player) achievment. I did this on 10 man mode, after having killed him after having pushed the big red button. Doing this gave me Schematic: Jeeves! A pretty easy fight to complete on Normal Mode, and only slightly harder on Hard Mode with a full group of level 85s. You will still go through the 4 vehicle phases but each vehicle dies pretty quickly. Make sure to bring enough dps to get the Aerial Command Unit unit down before the other 2 vehicles can repair in phase 4. Soloed Firefighter (10 player) as an Affli Warlock with Voidlord/Fel Imp. Just soloed 25 man version as a 491 ret pally. Quite challenging and very enjoyable at the same time. 15 min enrage coupled with some fairly serious dmg in phases 1 and 4 made for a fine line between dps and survivability. Most likely if you can survive through the first phase you can probably kill it. is a must for talents. I also found Unbreakable Spirit and Speed of Light very useful for surviving particularly in phase 1. Phase 1 is mostly about surviving, the Shock Blast hits for 100k so its best to avoid it, though it wont kill you. DP can mitigate alot of damage in this phase as well. Phase 2 and 3 have pretty much no damage so you really want to focus on dps'ing and try to get through as quickly as possible. I found i could get through phase 3 very quickly if i waited till i had 2 Magnetic Core, and used AW, GoaK and a mogu pot to burn him down. If you have less than 5 mins before the enrage going into the last phase you probably wont make it. Phase 4 is actually easier to survive in then the first phase since you can get alot of self heals by targeting VX-001 and using HotR + SoI. AW will help burn down the head in this phase, as combo of judgement, exorcism and HoW will bring down it HP fast. Beyond that its just about keeping yourself alive while getting the other parts below 10%, and trying to have your cd's up for the final burn. Unless your dps is awesome i don't think you can afford to have any part heal so you have 1 shot to kill all 3 parts. 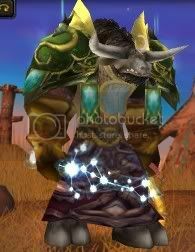 A brilliant inventor, Mimiron has been responsible for several of the most advanced mechanisms on Azeroth. But ever since he was subjected to Loken's disturbed influence, this watcher of Ulduar has only constructed war machines. Mimiron is one of the more complicated fights in Ulduar. As a raider, you never actually fight him - you battle four of his vehicle creations: The Leviathan MK II, which is his personal version of the Flame Leviathan; VX-001, which is a robotic unit; the Aerial Command Unit, which is a flying vehicle; and the ultimate V0-L7R-0N, which is a combination of the previous three. During Phase 1, Mimiron will use his Leviathan MK II to swap between devastating melee and ranged attacks. Proximity Mines will be a danger to the melee if they don't watch out where they run. Plasma Blast requires huge heals on the tank, and even a defensive cooldown. Shock Blast should send all melee running 15-20 yd away from the Leviathan, and Napalm Shell should be healed through. VX-001 is the next vehicle. It's a robotic unit that has no aggro table and shoots Rapid Bursts at random people. Heat Waves will cause a lot of raid fire damage. The occasional Rocket Strikes will mark a small circle on the ground and fly to it, killing anyone standing over - both a red mark and a beam of light will mark the deadly location. Finally, whenever Mimiron begins to cast Winding Up, everybody should stack behind him and move slowly as he rotates, in order to stay behind and avoid the P3Wx2 laser. 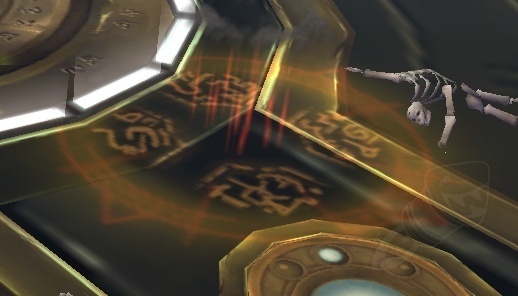 Casters and Ranged DPS should stay close to Mimiron to make the avoiding of the laser easier. An Aerial Command Unit (ACU) is the third vehicle. 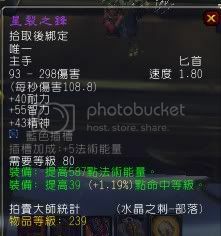 For the most part Mimiron will be attackable only by Casters and Ranged DPS. A ranged tank should be assigned to keep the boss stationary. Everybody else should be killing the three kinds of bots. Bomb Bots will be spawned by Mimiron underneath ACU - they should be rooted and killed by ranged DPS. Junk Bots spawn off green beams around the room and are generally not a threat. Assault Bots spawn off red beams and need to be tanked properly and killed quickly. Upon death they drop a Magnetic Core, which needs to be dropped right under ACU - this will bring him to the ground for several seconds and cause him to take extra damage. All DPS should switch on him. After the ACU is defeated, Mimiron will create his ultimate vehicle - V0-L7R-0N, a combination of all 3 vehicles he has used so far. Each of the former vehicles will have 50% of its original hit points, and will be targetable individually. The different parts keep some of their abilities. MK II keeps Shock Blast and Proximity Mines. VX-001 keeps P3Wx2 Laser Barrage and Rocket Strike, while gaining a more powerful version of his Rapid Burst, called Hand Pulse - a single pulse that damages players between the caster and a random target. ACU will keep Plasma Balls. Players will need to destroy all 3 parts at the same time, because they "revive" each other. Proximity Mines - Drops 8-10 Proximity Mine around V0-L7R-0N's MK II. After a small arming time, the mines will inflict 12,000 Fire damage to anyone who walks over them. Shock Blast - After a 4-second cast, V0-L7R-0N's MK II will inflict 100,000 Nature damage to all enemies within 15 yards of him. Hand Pulse - Inflicts 4,242 to 4,758 (25 Player: 6,598 to 7,402) Spellfire damage to a random target and all enemies between the caster and the target. P3Wx2 Laser Barrage - After a 4-second cast, V0-L7R-0N's VX-001 will shoot a laser in a random direction and spin slowly. The laser will inflict 20,000 Fire damage every 0.25 seconds, and will last 10 seconds. Rocket Strike - V0-L7R-0N's VX-001 will fire two rockets that will travel to a location underneath two of the players. Reaching the location, they will inflict 5 million Fire damage to everyone in 3 yards radius. During all the duration of the spell, the MK II component is stunned. Fiery Explosions - Mimiron will randomly select 3 players, who will explode soon. A fire will spawn from each explosion (for total of 3 fires). The fires will slowly chase raid members and may switch targets on the way. Used during all phases. 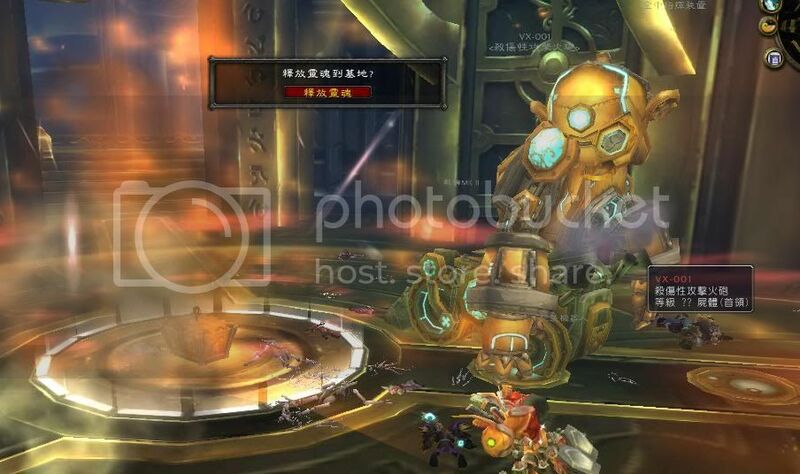 Flame Suppression (Phase 1) - 60 seconds after engaging, Mimiron will flood his chambers and douse all currently spawned fires. Frost Bomb (Phase 2, Phase 4) - Spawns a Frost Bomb in one of the triptychs of the room. The Frost Bomb will grow for several seconds and then explode, dousing all flames in that triptych and knocking players back. Emergency Fire Bot (Phase 3) - Uses Deafening Siren (25 Player), which silences players in 15 yards radius. Attacks with Water Spray, which inflicts 18,850 to 21,150 Frost damage, douses flames within 15 yards and causes knockback. Mimiron yells: Behold the VX-001 Anti-personnel Assault Cannon! You might want to take cover. Mimiron yells: Gaze upon its magnificence! Bask in its glorious, um, glory! I present you with... V-07-TR-0N! Mimiron yells: Isn't it beautiful? I call it the magnificent aerial command unit! Mimiron yells: It would appear that I've made a slight miscalculation. I allowed my mind to be corrupted by the fiend in the prison, overriding my primary directive. All systems seem to be functional now. Clear. Mimiron yells: Now, why would you go and do something like that? Didn't you see the sign that said, "DO NOT PUSH THIS BUTTON!"? How will we finish testing with the self-destruct mechanism active? Mimiron yells: Preliminary testing phase complete. Now comes the true test! Mimiron yells: Thank you, friends! Your efforts have yielded some fantastic data! Now, where did I put-- oh, there it is. Mimiron yells: We haven't much time, friends! You're going to help me test out my latest and greatest creation. Now, before you change your minds, remember that you kind of owe it to me after the mess you made with the XT-002. Mimiron yells: WONDERFUL! Positively marvelous results! Hull integrity at 98.9 percent! Barely a dent! Moving right along. Proximity Mines – Deals 57 Fire damage to all enemies within 3 yards. Shock Blast – Deals 238 Nature damage to all enemies within 15 yards. Napalm Shell – Fires a shell filled with napalm at a random enemy target. The shell explodes upon impact, dealing 38 Fire damage instantly and an additional 152 over 8 sec. This effect attempts to target enemies over 15 yards away if possible. Plasma Blast – A stream of plasma errupts from the cannon, dealing 81 Spellfire damage per second for 6 sec. This effect cannot be resisted. Rapid Burst – Unleashes a series of short plasma bursts towards a random enemy, dealing 7 Spellfire damage per burst for a total of 6 bursts over 3 sec. P3Wx2 Laser Barrage – Spins up the dual cannons for 4 sec before unleashing a spray of lasers in a random direction, dealing 95 Spellfire damage every 0.3 sec to all enemies caught inside. Lasts 10 sec. Rocket Strike – Launches a rocket towards a random enemy. Once the rocket reaches the destination, it deals 190 Fire damage to all enemies within 3 yards. Heat Wave – Fires out a blast of heat, dealing 10 Fire damage instantly and an additional 48 Fire damage over 5 sec to all enemies. Plasma Ball – Builds up a ball of plasma and fires it at a target, dealing 48 Spellfire damage. Magnetic Field – Projects a magnetic field towards the target, locking them in place. In addition, the target will take an extra 30% damage from all sources. Lasts 6 sec. Magnetic Core – Deploying this magnet under the Aerial Command Unit will temporarily bring it to the ground and disable it. While it remains disabled, it will take an additional 50% damage from all sources. Bomb Bot – Detonate when they reach their target. Bomb Bot – Sacrifices the caster and deals 119 Fire damage to all enemies within 5 yards. Junk Bot – Just junk. Hand Pulse – Fires a pulse of energy towards a random enemy, causing 21 Spellfire damage to all enemies in a cone facing the target enemy. Self Repair – Heals the caster for 50% of their total health. This is an automatic process that is triggered when the caster reaches low health. If all three parts are destroyed before any can repair themselves, the repair process will be interrupted and the caster will be permanently destroyed. Emergency Mode – Activates a heightened response mode in emergency situations, increasing damage and health by 10%. Flames – Flames will periodically break out across the room! Flames inflict 24 Fire damage to enemies within 3 yards. Flame Suppressant – Sprays Flame Suppressant into the air, coating the room and dousing all flames. In addition, any enemies affected will have their cast speed slowed by 50% for 8 sec. Frost Bomb – After a short delay the Frost Bomb explodes, extinguishing any fire within 0 yards, but also dealing 238 Frost damage and knocking back any enemies caught within the blast. Deafening Siren – Silences all enemies within 10 yards of the caster. Water Spray – Shoots a powerful cone of water that douses any flames within 15 yards, and deals 95 Frost damage and knocks back any enemies caught in the spray.